Google is offering users of its News service a new way to sort out the myriad stories offered on the site – by adding a star next to their preferred subjects. This is a boon for those who want to weed out the stories relevant to them, instead of having to trawl through all the needless bumf that sometimes clogs up the Google News feeds. Once you have starred a headline you like, this will go into a starred field on the left-hand column, creating your very own customised news source. 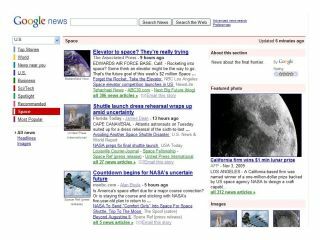 "Users can mark a story cluster by clicking on the star next to it, like they can with messages in Gmail and items in Google Reader," says the Google blog. "When you star a story in Google News, it's one way to let us know that you're interested in that subject." This new features is all part of the custom rollout Google began a few months ago. These let you create news fields by adding relevant keywords to the Create Your Own section. This meant that those with an insane interest in pink bunny slippers could now create their own dedicated field to the subject. There's no word on whether you can share you starred news feed, but knowing Google this option is not far away.